My entry for Cee’s Odd Ball Photo Challenge: April 16, 2017. Need any help to clean your refrigerator? Thanks, Cee. He is 2.5 year old, and he definitely knows what he wants. Ha. Sounds like a fair price, but if he gets too many jobs – he won’t fit in the frig !! 😉 You got that right! I wish he lived closer to us! Thanks for the smile across my afternoon. This is so cute. I love the little chair there to boost him up/in. Thanks, Lois. First he carried a big chair to the frig. His mother stopped him. Then he did this. 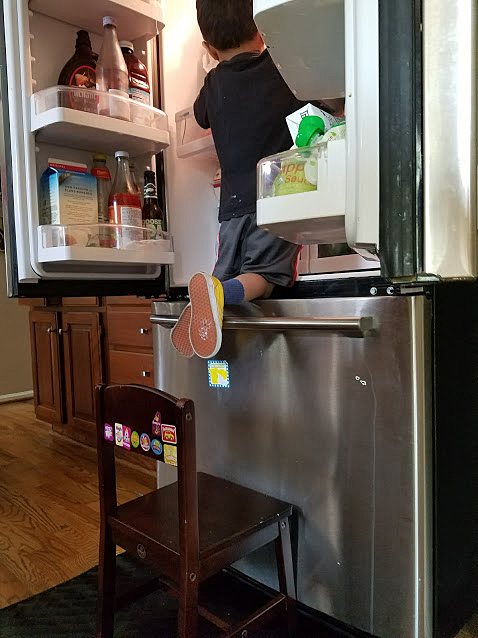 He did it quietly, so when his mother found out, he was already in the frig. I’m having trouble with my wireless keyboard. Feel free to delete the previous one. Thanks, Amy. I didn’t take this photo; my niece-in-law did. It made me laugh so I wanted to share. Kids are so fun. I think time to child proof the house. Unplug all electrical equipments! Your refrigerator looks just like mine! What a fun photo. Great, little moment. Don’t let you nephew loose anywhere, I would think! Thanks, Otto. Who knows such a sweet boy can require so much work to take care of… Ha. I bought the two books you suggested, couldn’t put it down. Thank you so much for suggesting them. They are exactly what I was looking for.